We love to tell you about the products that have kept our pack healthy and happy through the years, and we’d be remiss if we didn’t highlight the complete awesomeness of the HyperDog Play Pack. 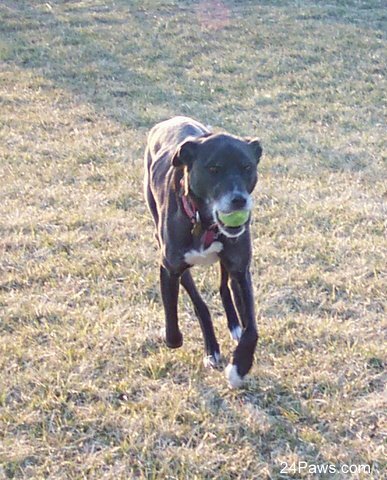 Our boy Frosty, a couture assumed mix of Labrador, Greyhound, and Pit Bull, loved running and toys. When we found the HyperDog Play Pack, he instantly fell in love, and we no longer feared another rotator cuff injury. Frosty finally met his match with the HyperDog Launcher. As he would run to retrieve a launched ball, I had another ready to roll when he returned. 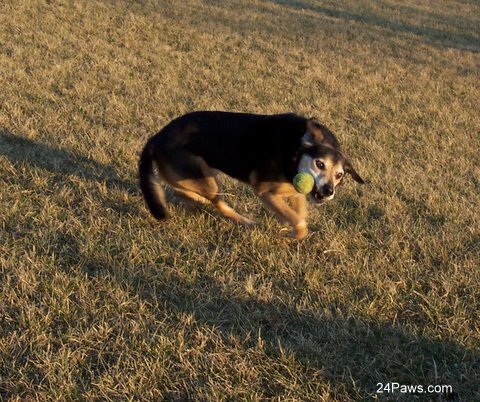 When he saw us pull the HyperDog Launcher from the cabinet he would run, sit, and wait in anticipation, knowing that a ball was soon to be launched for him to fetch. 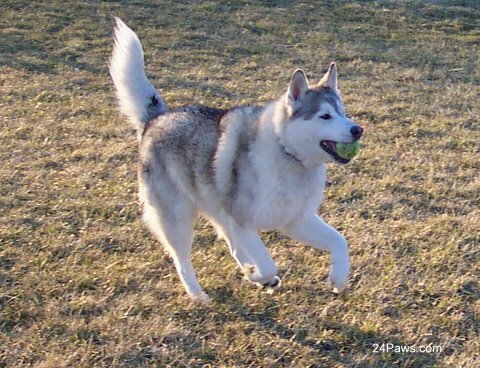 Tristan loved the smaller size and shape of the tennis balls and soon started chasing them down. Not bad for a dog who deemed most toys “unworthy” of a good chase. Grandbury loves Frisbee, but fearing he would injure a tooth, we never felt comfortable throwing one his way. The HyperDisc allowed him to catch some air again. As for replacing the band/pouch on the launcher, we didn’t find it necessary for over a year. 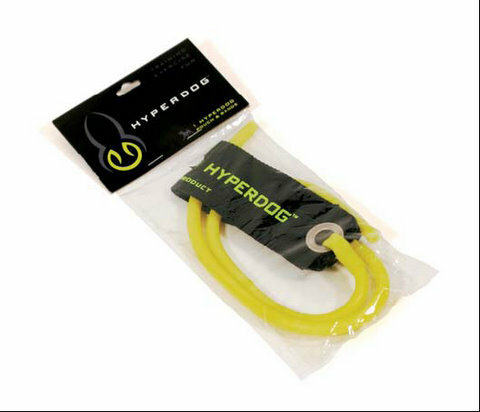 Your use will vary, but we’ve found the HyperDogs products are long lasting and quality made. Get your complete play pack while we’ve got’em in stock! Remember: a tired dog is a good dog. This pack is great for multiple dog households and portable for trips to the park and lake. 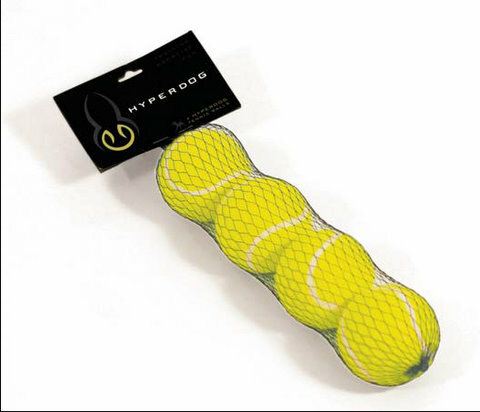 The HyperDog 2 Ball Launcher can shoot the tennis balls 220 ft., has hands free pick-up, is collapsible for easy transport and storage, and is made from a rust resistant steel. The Launcher gives you arm and hand support that will keep you in the game until your dog has had his/her fill of the fun. 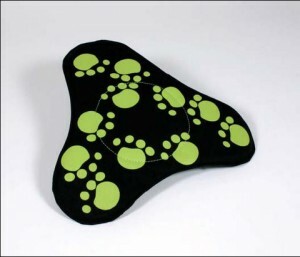 The HyperDisc is a fun flying disc for your dog. Soft sided and covered with a paw print repeating pattern, you’ll always be able to locate your disc at the park. The HyperDisc is soft for safety and your dog’s mouth (no hard plastic to injure your dog’s teeth), it floats, has a gently arched shape for easy pick up, catches some great air and height, and is durable. The HyperDisc is a great tool for training. Frosty and Tristan race to get the ball. Almost… Grandbury shoots past the ball, almost capturing it mid-air. Tristan proudly displays his catch. Frosty returns the ball to have it launched again!